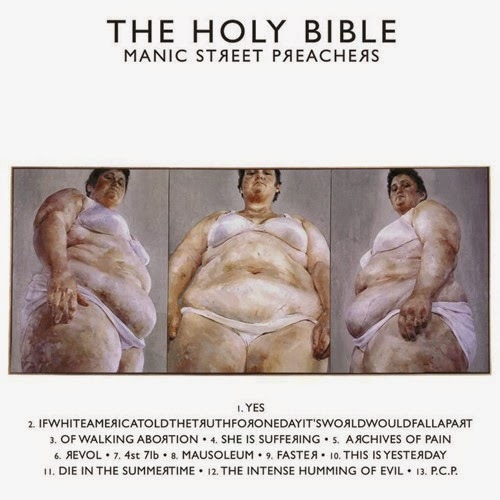 I go a long way back with Manic Street Preachers. Although I owned both of their first albums, I think the very first time that I saw them performing live was at the Reading Festival in 1994. They played on the Saturday afternoon of the festival with their third album, “The Holy Bible” due to be released the following week. They’d been in the headlines a bit in the run-up to the gig, partly because of the imminent release of the new album, but also because their guitarist, Richie James Edwards had entered a clinic for treatment for his alcohol problems and the band were forced to play as a three-piece as he recovered. The big draw for me at Reading that year, and the main reason I was there in the first place after attending Glastonbury for the first time the year before, was because the Red Hot Chilli Peppers were the main stage headliners on the Saturday night. As things turned out, they were pretty good that night, in the middle of their “One Hot Minute” tour and performing with those flaming hats and suchlike. When I think back to that festival, there were three other bands that made significantly more impact on me that day than the headliners: I saw Pulp performing “Common People” a year or so before the release of “A Different Class”, I saw an electrifying Jeff Buckley perform in the Melody Maker tent (by accident really – I was only there to watch Gene, who were on next) and I saw the Manic Street Preachers playing songs from “The Holy Bible”. I’ve seen the band many times since, but that was to become a landmark album for me, and it was always a source of frustration that they didn’t play songs from it live very often. I don’t remember much about their actual performance, although I do remember them doing a cover of “Pennyroyal Tea” and I’m sure they were wearing all their combat gear. What I do remember is that I stopped in Milton Keynes shopping centre on the way home on Monday afternoon to try and buy a copy of the album. In theory it was released that morning, but in practice it was an August Bank Holiday, and in 1994 that meant that all of the shops were shut. Imagine! I did manage to get a copy of the album on CD, but in September that year, I went to study in Venice and didn’t have access to a CD player, so made a copy of the album on cassette. I played that tape to death. I have very clear memories of walking over the Academia bridge on my way back across town to our flat at around 2am , with fog sweeping off the lagoon and across St Mark’s Square. I had the whole place to myself and was listening to songs like “Yes” and “4st7lb”. It was a special time and that album holds a special place in my heart. Obviously, when the band announced that they would be playing the whole album, in full, I was very keen to get myself a ticket, even if it meant travelling to the Roundhouse in Camden to do it. This was Richie’s album, and after his disappearance in 1995, understandably the remaining members of the band seemed reluctant to play material that probably brought up difficult memories for them. I never thought I would see the day, but here it was. How could I miss this? I’m not sure that a detailed review is going to adequately explain how this gig made me feel. I’ve waited twenty years to hear this, and here it was, complete with a stage set draped in camouflage netting and the band in combat gear. When the intro to “yes” played across the PA, I thought I was going to burst into tears. I have a powerful connection with this music and this might just be my favourite album by any band. The band played the album straight, in tracklist order with very little talking and with no nonsense. They sounded brilliant. I’d read reviews from earlier gigs on this tour where people were saying that the whole crowd was shouting along with every lyric. Well, that wasn’t true here – perhaps they were too busy queuing for the craft beer you could buy in the venue. At one point, I even had to turn to some guys standing next to me and ask them to stop chatting during the songs, so we weren’t at that kind of level of mass participation by any means. As I watched, two things really struck me. Firstly, that these lyrics are quite extraordinary; there’s really nothing else quite like them. They’re ferociously bleak and incredibly dense. Richie was clearly on a downward spiral when he was writing these words, but the spark of his genius was burning brightly. He’s not throwing in those references to make himself sound clever, I really think he was 4REAL. 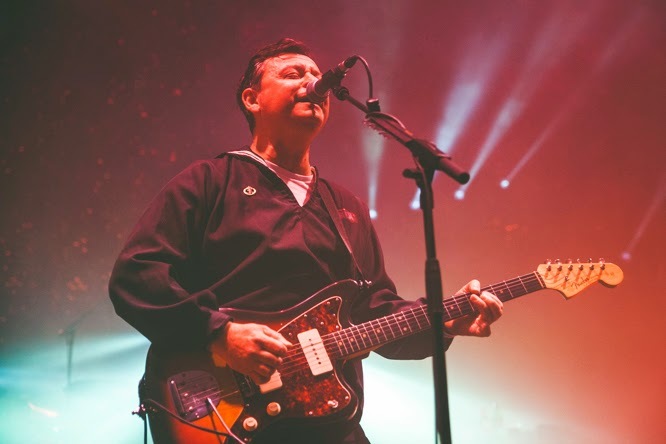 This observation leads straight into the next… that James Dean Bradfield and Sean Moore did an amazing job putting these songs to music and really making them work. Furthermore, JDB performs like a superhero tonight to sing these songs live with barely a mis-step. This is true on the record, of course, but it’s really something to see it work live. It really is a towering achievement. 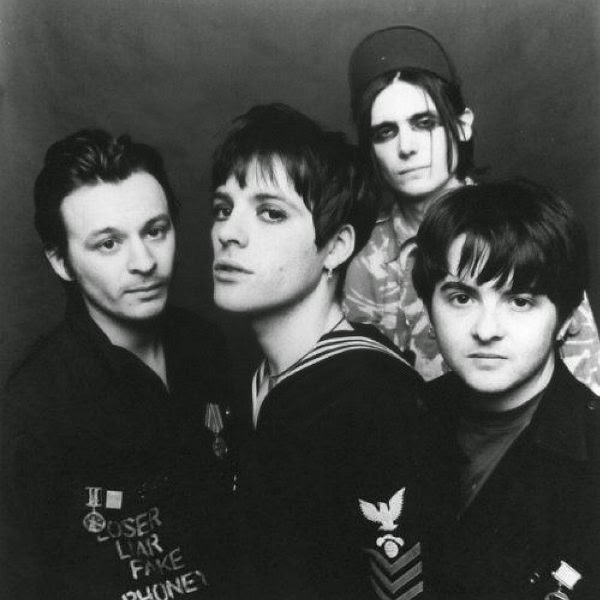 My friend Mark has seen the Manics hundreds of times, and he’s written that this was the first time he has ever seen them looking backwards in their whole career, and it made him a little sad to witness it. I know what he means: the Manic Street Preachers as a band have resolutely looked forwards in their career, and it’s perhaps because of this that they are still making music as good now as they’ve ever made at any point in their career. Performing like this, no matter how good the material you are working with, inevitably forces you to look backwards and to dwell on your own past, no matter how glorious that past might be. It’s an interesting point, and a good one: at this gig, the Manics of 2014 are pretending to be the same band that they were in 1994. Of course, there’s one very simple reason why they never can be: the disappearance and presumed death of Richie Edwards. He was never much of a musician, but he’s so conspicuously missing when they play these songs because, above everything else in their back catalogue, his fingerprints are unmistakeable. It’s interesting that for their second set, playing other songs, the band supplement their sound with an extra guitar and a keyboard. For the Holy Bible, they honour their missing comrade. I could take or leave that second set: for me, it was oddly paced, and although it contained some bona fide classics like “Motorcycle Emptiness” , “If You Tolerate This” and “A Design For Life”, it’s very much after the Lord Mayor’s Show. The crowd noticeably thins too: perhaps the back ends of Camden are no place to be caught out late on a Tuesday night in December. Who knows. It’s good, but the intensity of the first act is entirely missing. How could it not be? For the hour when the band are playing “The Holy Bible”, though, I am captivated. It’s an astonishing album, and I’m so pleased that I got the chance to see the band play it again. That record is twenty years old now, and my appreciation of it is broadening and deepening with every listen. It’s their towering achievement as a band and it’s my favourite ever record.